Electromotive control system motion chair. the vibration frequency,make the audience feel on the back of the suddenly"vibration",haveeintense "Push Back"
Combination: 1person/set, 2persons/set, 3persons/set, 4persons/set. 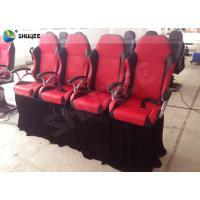 3seats/chair but also 2seat/chair - 4seats/chair for you choose and there are several kind of color you can choose,we can also custom made the cinema chair as you want.